Duke University Press, 9780822348733, 515pp. A daughter of the poets Hettie Jones and Amiri Baraka, Kellie Jones grew up immersed in a world of artists, musicians, and writers in Manhattan's East Village and absorbed in black nationalist ideas about art, politics, and social justice across the river in Newark. The activist vision of art and culture that she learned in those two communities, and especially from her family, has shaped her life and work as an art critic and curator. 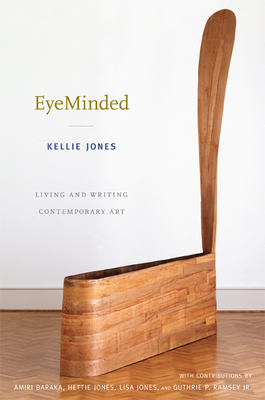 Featuring selections of her writings from the past twenty years, EyeMinded reveals Jones's role in bringing attention to the work of African American, African, Latin American, and women artists who have challenged established art practices. Interviews that she conducted with the painter Howardena Pindell, the installation and performance artist David Hammons, and the Cuban sculptor Kcho appear along with pieces on the photographers Dawoud Bey, Lorna Simpson, and Pat Ward Williams; the sculptor Martin Puryear; the assemblage artist Betye Saar; and the painters Jean-Michel Basquiat, Norman Lewis, and Al Loving. Reflecting Jones's curatorial sensibility, this collection is structured as a dialogue between her writings and works by her parents, her sister Lisa Jones, and her husband Guthrie P. Ramsey Jr. EyeMinded offers a glimpse into the family conversation that has shaped and sustained Jones, insight into the development of her critical and curatorial vision, and a survey of some of the most important figures in contemporary art. Kellie Jones is Associate Professor in the Department of Art History and Archaeology at Columbia University. She is the author of several books and exhibition catalogues, including Energy/Experimentation: Black Artists and Abstraction, 1964-1980; Basquiat; and (with Thelma Golden and Chrissie Iles) Lorna Simpson.